Lots of people have a bucket list of some sorts. Many bucket lists (like my travel bucket list) include far and exciting destinations to go see or events to witness at some point in your life. Your list may be full of things like experiences and food you want to try, or maybe you even have a bucket list for the year and the summer where you include self improvement goals you want to accomplish and achieve. What if we gave this same level of thought to our homes? Hang in there with me for a moment. A bucket list can be anything that you want to achieve and experience, and so you can create your own bucket list for your home. It may be long term goals for your home, it may be thoughts and desires for future homes, or it could simply involve the type of home lifestyle you want to create someday. 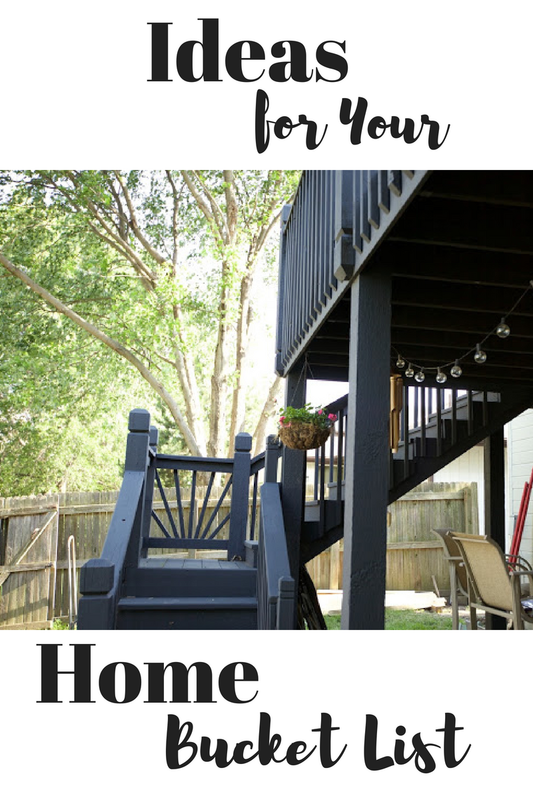 Here are some ideas to create your own Home Bucket List! Change the interior decor with the seasons. A simple place to start is by changing things up on the inside of your home each season. This way, you don't take on a big investment or massive jobs that need to be done. To freshen up your new look, try out websites like Deconovo, which are full of different interior decorating pieces you can get to help you feel inspired by the seasons. Some great places to start are floral patterns for cushions, new colors to embrace and add to your living spaces, and greenery- especially succulents. Decorate your home with your favorite colors. Another really easy place to begin your bucket list is by changing up color. Color is one of those things that's really a personal taste issue. It's one of the best ways to inject personality into your home. You can add color to the walls or you can add it subtly through your choice of home furnishings and accessories. Feature walls can give you the confidence to inject a brighter color into a space without it feeling too overwhelming, and you can even use color to give more effect of light or an open space. Be clever with your choices while ensuring you embrace what you love. Change the way you use some of the rooms. Another idea, especially if you aren't ready to tackle a big build job, would be to simply repurpose some of the rooms in your own home. We often feel like we have to conform to a certain way of a living, but a living room doesn't have to necessarily be that if it would suit you and your family to be something else, like a dining room or even an at home office for your small business. Changing the use of a room could help you make your current living space work better for you. Add on to or renovate your home. If you're willing to dream a little bigger, but love a lot about your current home, you could start by adding on or renovating your current space! This could really change the way your home looks and feels. Renovation is a popular way to make your current home work for you. It might give you the extra space you need, the living arrangements you like (such as a gorgeous open floor plan), or it could give you the extra push you need to make as much money as you can by selling this home so that you can move on to your next. An addition might feel like a big job, and depending on what you are doing, it could take some time to complete. But the finished product will be worth the wait. Here's the big bucket list dream- building your own home. This is a goal for us! If money was no object and the perfect plot of land became available, building your own home is the absolute dream. Yes it may sound drastic, but actually building your own home isn’t as complicated, or probably even as expensive as you imagine. Sure, it is pricey, there is no question of that, but you may find that building the home you want (exactly as you want, not settling for something) will be a fraction of what it would be to actually purchase one- especially if you can subcontract it yourselves. It could be a legitimate possibility for your future and certainly isn’t a dream to disregard! Dream big, y'all! Everyone has different preferences on ideal living location. Maybe it's your dream to live in the country, so you may want to add it to your home bucket list because you'd love living in wide open spaces some day. We definitely love the idea of owning land and having some space. There are definitely some great advantages to living in the countryside, especially the open aspect and the fields. You could even have the opportunity to have more animals and try things like having your own garden, chickens, or even livestock. You might spend more time outdoors and embrace a slower paced life. On the flip side, you may be someone who dreams of living in the city, and again this could give you a totally different lifestyle. You may want to be close to where all the action is happening, and being in the city puts you a matter of minutes (or even a short walk or metro ride) from fine dining, shopping, and tons of entertainment and nightlife options). City life isn’t for everyone, but I think most people would like to experience it at least once in their lives. Add on a pool, gym, or whatever your dream is. Finally, what is the dream for your ultimate house? Is it a pool in the backyard? (I grew up with one and it is the BEST.) Is it a home gym, a tennis court, or just lots of land so that you can have animals, grow your own food or even start your very own small farm? Like any bucket list, it's good to have a dream, a dream where you can feel like you have something to work towards. It can be as elaborate or as big as you want it to be. But remember every scenario is a possibility. Start with big dreams, and put your plan into action. I hope that this gives you the home improvement inspiration you need for this year! We're definitely taking strides towards our own home bucket list this summer. There is exciting stuff ahead, which I'll be sharing more about later! What's on your home bucket list? Excellent blog. Keep it up. However, Want to find a way to connect more with the people closest to you? At Flowjo, we created the Couple's Bucket List. The Couples Bucket List can help you with that! So that you never miss another moment again.